I can't build the mqtt-client succesful could you suply a download link to a working .jar file. Would really like to test the demoproject. would like to know if there are any tools to debug. Or would there be anyway to know if the lib I've compiled using mvn is functioning correctly. Thanks for sharing the demo application! 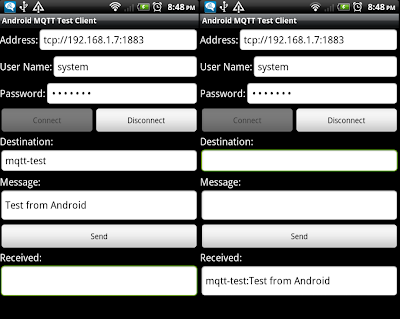 I was wondering if you have tried using as-it-is the Callback interface of FuseSource MQTT client on Android in order to get the updates assynchronously? I got some problems when modifying your app to use callbacks and I have the impression that the issue is the different callback/thread handling on Android. I managed to get it working with callbacks, I forked it here https://github.com/tcarlyle/android-mqtt-demo and now I am working on a small application on top of it. i am able to run but to run 1 to 1 what are the changes required. Thanks for sharing the demo application. Can you please help me understand how to create chat rooms (channels) using apache activemq? My use case is I need to create a chat application that can exchange messages with a single user or a group of users.